A popular ready-made meal, instant noodles are the first choice of those in need for time or money, especially college students. Even if you don’t think they are as bad as other fast food (burgers, fries, burritos etc. ), you might take a different stand after you read this. 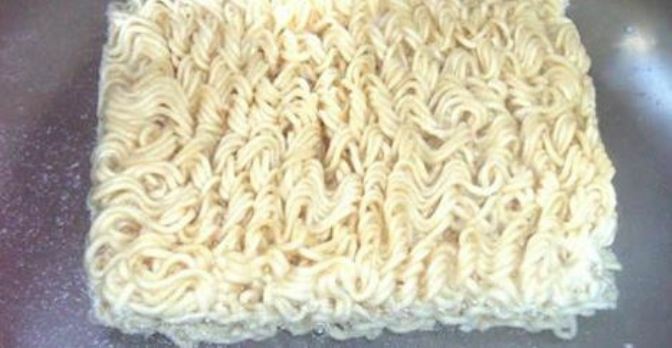 Ramen Noodles Don’t Break Down After Hours of Digestion. The video above shows ramen noodles inside of a stomach two hours after consumption. Even then, they are still intact, unlike the homemade ramen noodles used for comparison. This is a matter of concern for several reasons. For one thing, it puts additional pressure on your digestive system because it is made to work for hours in order to dissolve the highly processed food, which is rather ironic as most processed food lacks fiber and gets broken down quite fast. But, when food remains in the stomach for so long, it affects the body absorption of nutrients as well. Still, in the case of processed ramen noodles, there’s very little nutrition to be absorbed, but rather, a lot of additives, including the toxic preservative tertiary-butyl hydroquinone (TBHQ). If this additive stays in the digestive tract for so long together with the hard-to-break-down noodles, you can only assume what it can do to your health. Although TBHQ, a byproduct of petroleum, is often referred to as “antioxidant,” it’s important to understand that it is a synthetic chemical with antioxidant properties, rather than a natural antioxidant. It’s added in many foods, ranging from crackers to crisps to fast foods, to increase shelf life by preventing oxidation of fats and oils. It is commonly found in McDonald’s chicken nuggets, Kellogg’s CHEEZ-IT crackers, Reese’s peanut butter cups, Wheat Thins crackers, Teddy Grahams, Red Baron frozen pizza, Taco Bell beans, and many more. It is also added to varnishes, lacquers, and pesticide products, as well as cosmetics and perfumes to increase stability and decrease the evaporation rate. At its 19th and 21st meetings, the Joint FAO/WHO Expert Committee on Food Additives decided that TBHQ was safe for human consumption at levels of 0-0.5 mg/kg of body weight. But, the Codex commission set the maximum acceptable limits up to between 100 – 400mg/kg, depending on the food it’s added to. Thus, chewing gum is allowed to contain the highest levels of TBHQ. According to the requirements of the US Food and Drug Administration, TBHQ must not surpass 0.02% of its oil and fat content. A new study published in the Journal of Nutrition discovered that women who consumed more instant noodles were at a considerably higher risk of metabolic syndrome as opposed to those who ate less, regardless of their overall diet or workout routine. 68% of women who ate instant noodles more than twice a week stood greater chances of getting metabolic syndrome, which is a group of symptoms including central obesity, elevated blood pressure, elevated fasting blood sugar, elevated fasting triglycerides, and low levels of HDL cholesterol. What’s more, having three or more of these symptoms puts you at a higher risk of developing diabetes and cardiovascular disease. Even past research examining overall nutrient intake between instant-noodle consumers and non-consumers confirmed that instant noodles contribute little to a healthy diet. The instant-noodle consumers had a considerably lower intake of vital nutrients like protein, calcium, phosphorus, iron, potassium, vitamin A, niacin, and vitamin C in comparison with non-consumers. On the other hand, they had an excessive intake of energy, unhealthy fats and sodium (just one package may contain 2,700 milligrams of sodium). One sufficient reason to avoid instant noodles is the presence of monosodium glutamate (MSG), an excitotoxin that overexcites the nerve cells to the point of damage or death, causing various degrees of brain dysfunction and damage, and potentially even prompting or worsening learning disabilities, Alzheimer’s disease, Parkinson’s disease, Lou Gehrig’s disease, and more. In fact, MSG is approximately 78% free glutamic acid, which is the same neurotransmitter used by your brain, nervous system, eyes, pancreas, and other organs initiate certain processes in your body. But, MSG is the ideal obesity drug as mice for scientific study are fattened up with it. So, if you’re striving to maintain your ideal body weight, you should avoid MSG at all cost. Even though eating a package of instant noodles from time to time won’t necessarily kill you, the real problem occurs when processed food replaces real food and instant noodles are a perfect example of the type of processed food you should avoid as much as possible, as overindulging (having instant noodles at least twice a week) will unquestionably affect your health and weight. The high content of sugar, fructose, refined carbohydrates, and artificial ingredients, as opposed to the low content of nutrients and fiber is what makes processed foods the ideal means for weight gain and chronic disease. Not only are processed foods addictive and designed to make you overeat, but they also stimulate excessive food cravings, resulting in weight gain. Plus, they trigger insulin resistance and chronic inflammation, both of which are signs of most chronic and/or serious diseases. This shouldn’t come as a surprise because people have grown well on vegetables, meats, eggs, fruits, and other whole foods for centuries, whereas processed foods are only a recent invention. Cutting processed foods out of your diet calls for advance meal planning, but if done step-by-step, it’s quite possible, and manageable. For one thing, you can try exploring your local farmer’s markets for in-season produce that is priced to sell, and plan your meals accordingly. You can also do this with supermarket sales. What you can generally do is plan a week of meals at a time, ensuring you have all the necessary ingredients at hand, do any prep work ahead of time so that dinner is easy to prepare if you’re short of time.